Last week, at the end of a long road trip of speaking engagements and meetings, I enjoyed a special treat–a visit to the headquarters of online retailer Zappos.com. You may know Zappos for their amazing selection of shoes (and now clothes, accessories, and many other items). Or, you may know them for free shipping and free returns in the friendly white boxes. 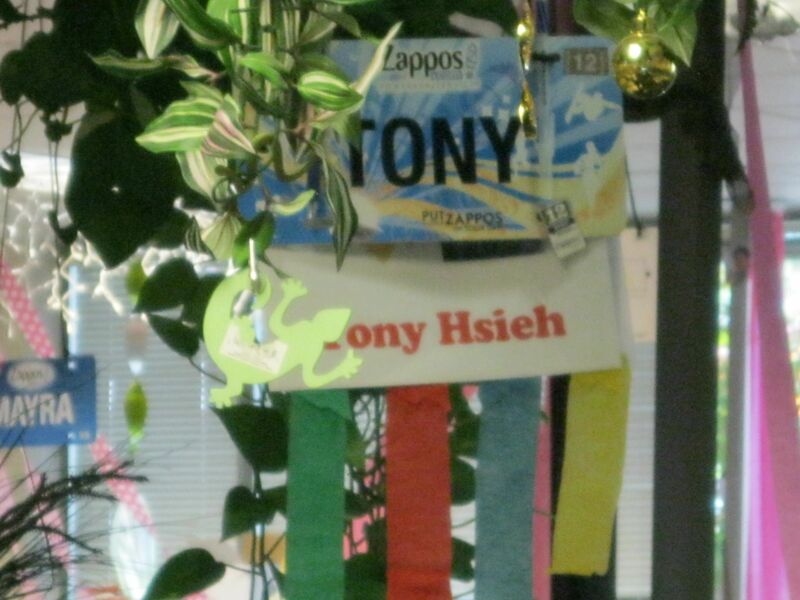 But in my hunt for places where people are bringing their superpowers to work, Zappos jumped onto my radar screen after I read CEO Tony Hsieh’s book, [amazon_link id=”0446563048″ target=”_blank” container=”” container_class=”” ]Delivering Happiness: A Path to Profits, Passion, and Purpose[/amazon_link]. 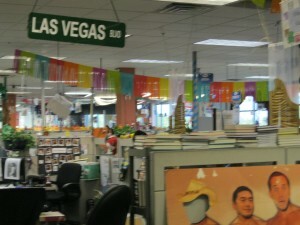 So here are the five most important things I learned during my visit to Zappos. And while your CEO may not have the vision of Tony Hsieh (who sits in a workstation in “monkey row”–see photo), I’m betting there’s an idea here for you to try for yourself to get–and stay–in your superpower space. Every action and business decision, down to providing teams a small stipend for celebrations and office decorations, can be tied to one of the values. Red Cape Revolutionary action: If your company’s values aren’t clear, do you know what your personal ones are? I often find that when something’s not working at work, it’s because our personal values are conflicting with the values of our organization. 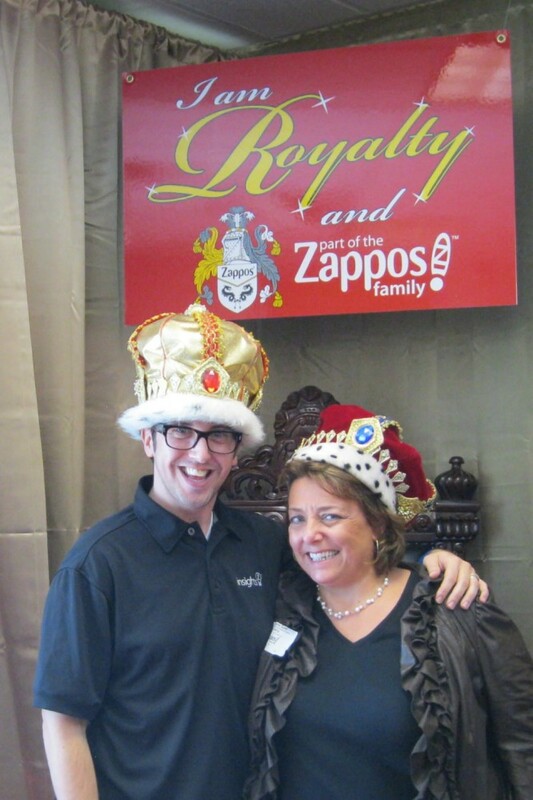 Clarity works for Zappos, and it can work for you. 2. Fun doesn’t have to be a distractor. One thing you notice about the Zappos environment is that there’s a lot going on. It’s loud. Colorful. Friendly. Red Cape Revolutionary action: Even if fun isn’t a core value in your office, where can you create a little for yourself? Maybe it’s as simple as bringing in something colorful to cover up the taupe fabric on your workstation, or inviting a couple like-minded colleagues to a monthly lunch to talk about books, movies, or something creative. The best fun is organically grown–what would be fun to you? 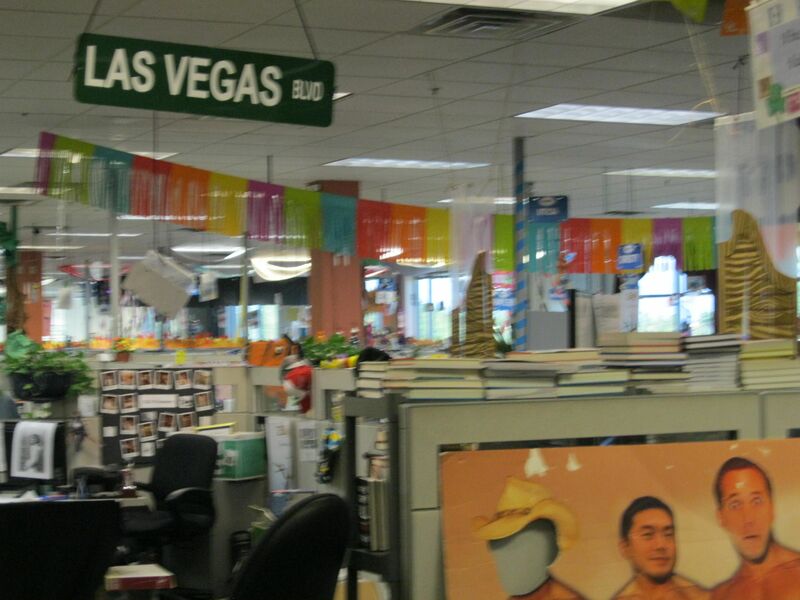 Zappos is growing fast, and hiring (web developers and programmers who want to live in Vegas, please apply). But because their culture and environment is so important to them, the hiring process is careful and deliberate. And s-l-o-w, which may seem surprising for an environment that moves so fast. For many jobs, the process starts with several online skills test. (I didn’t ask how many people drop out after those tests, but you can imagine that there is a automatic screen there for motivation.) Also, in addition to screening for the job requirements, the initial application and interview process may include questions like “On a scale of 1-10, how weird are you and why?” Rigid thinkers need not apply. Hiring doesn’t end with a job offer. In keeping with their value to “Be Humble, ” everyone hired goes through their 4-week customer loyalty training (part company onboarding, part call center training), and some team members drop out after that. However, even their new CFO, Chris Nielsen, completed this training, amid a class of 20-something pierced and tattooed future phone reps. Can you imagine your CFO sitting in a call center classroom for four weeks? One of the team told us that everybody knew this was happening and it served as a reinforcement that their culture was respected by the new guy in the C-suite. Red Cape Revolutionary action: I know from my work with leaders and managers that when you have an open position to fill, you wanted it filled yesterday. But the Zappos process is proof that investing time to with candidates pays off in fewer challenges later. Separately, for those of you who seeking job or even industry changes, it’s a good lesson for you to take your time and do your homework on the culture and environment–even if it’s not a formal part of the company’s process. Knowing what you’re getting into pays off. 4. If you’ve got it, flaunt it. Red Cape Revolutionary action: What’s great about your company, department, or even your own job that you could share with others? Maybe you aren’t ready to open up your space to tours, but could you write a blog post, make a video, or just show up at a professional event and tell your story? At a minimum, you’re always welcome to brag on yourself here in the comments or tell us what you’re doing on Facebook! I love to hear what’s working for you! Okay, okay, as a professional coach, I know this, but it’s always nice to see more real-life examples. Zappos has Goal Coaches on staff, and team members can sign up for a 4-week stint to focus on one particular change they’d like to make (yes, there is a waiting list.) The changes can be related to work, but often they are personal, like getting their finances in order or losing weight. 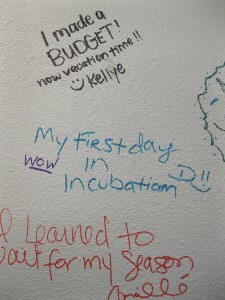 After their success, there’s a wall they can write on to share their story (see photo). That’s it! I’d love to hear your reactions or other questions–in fact, as a special thanks to you, I’ll be sending a copy of [amazon_link id=”0446563048″ target=”_blank” container=”” container_class=”” ]”Delivering Happiness”[/amazon_link] to someone randomly selected from among ALL comments posted on this blog (just “leave a reply” below) or shared on our Red Cape Revolution Facebook page! Will it be you?? Talk to us and see!! Loved the Zappos write up! I order from them (shoes, dresses) and it’s clear there’s something different about their culture that results in noticably great service.